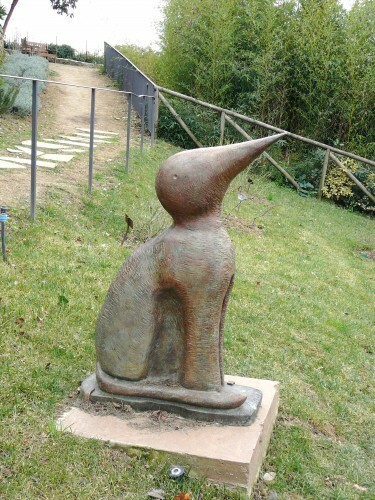 The imagination and whimsy of Jean-Michel Folon’s sculpture gift to the Rose Garden in Florence (February 8 post) led me to discover more about this extraordinary artist. 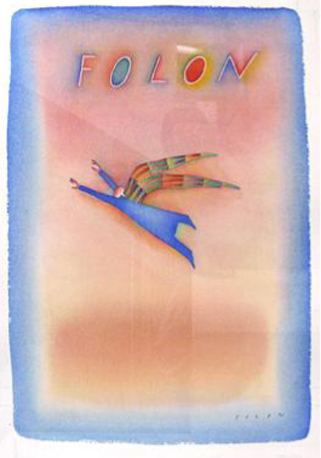 A quirky story about an 80-year-old yacht saved by Folon at the end of his own life caught my attention..
Folon said, “I’ve spent all my life trying to fly and I assure you that I can’t, I’ve spent my life drawing blue men who flew, and during my life, I’ve also drawn many rainbows.” In 2001, he found a tangible rainbow. He told this story: Some years ago I was in Roma with Federico Fellini, in the street and under the rain, and Federico had an appointment with his doctor. After a while he put his big hands on my shoulders, looked at me and said “We’ve spent our life fulfilling our childhood dreams”; we all had dreams when we were children, and I believe that when we were children we all thought, “one day I’ll fly”. Childhood dreams are very important. In life we all face reality soon, it stresses us and it takes everything away, our energy and our time. All things considered, all the children are the same when they say, “when I’m a grown-up, I want to fly, I want to find a boat and sail far away”. 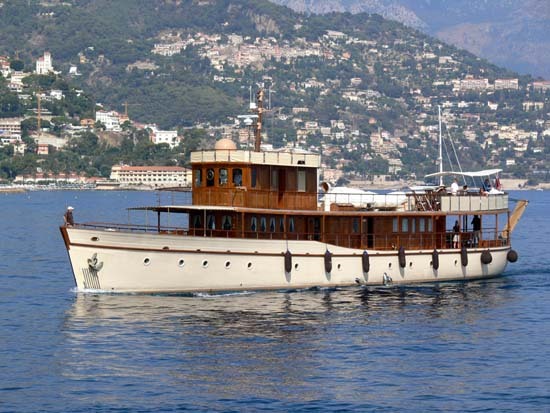 It was in 1930, when W. G. Hetherington from Glasgow had his 34 meters (115 foot) yacht, Janetha IV, built at Dickie & Sons Shipyard in Bangor, North Wales, in order to allow himself relaxing cruises together with family and friends, along the coasts of Scotland. In the years that followed her launching, Janetha IV sailed in the Scottish waters until 1939, at the beginning of the Second World War, she was commandeered by the Royal Navy and put at its disposal as coastal patroller. In the years that followed the war, after a short period spent sailing in America, the yacht arrived in the Aegean Sea. In that period, in Greece, the Janetha IV, at the anchorage off the harbor of Athens, was transformed into a little floating casino. The yacht, whose name was then changed in Ismini III, disappeared for a long time, almost forty years, until, at the end of the eighties, an English owner bought her, renamed her Classique, and used her as a charter yacht, a successful market for about ten years, until a new owner moved the yacht to Cote d’Azur, where it was left in a state of neglect; virtually abandoned until Folon discovered her in 2000. In 2002, the renamed Over The Rainbow arrived at Mondomarine’s slipway in Savona, a shipyard the construction of large yachts. 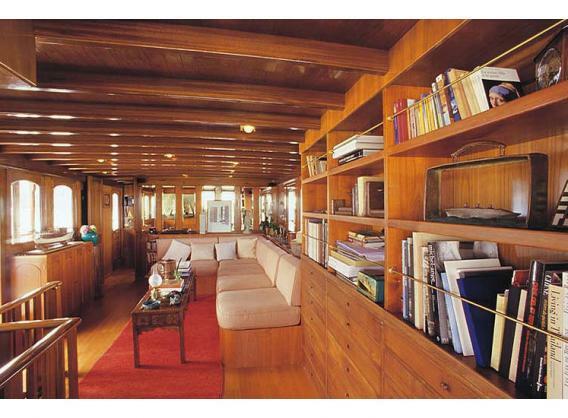 Folon was avidly involved in the rebirth of the adventuresome boat. Two years later, Over the Rainbow was launched. Folon enjoyed just over a year gazing at his billion of stars before he succumb to leukemia at the age of 71 on October 20, 2005. To read more about the restoration of Over the Rainbow. 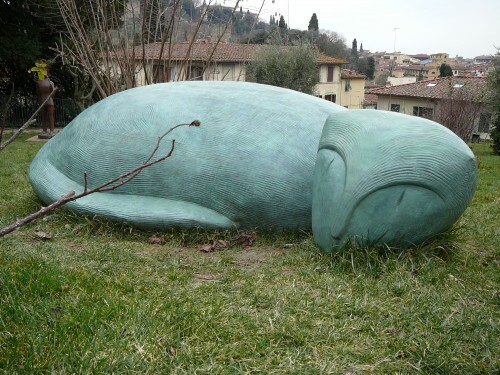 I was intrigued by the sculptures of Jean-Michel Folon the first time I left Florence by car going south. 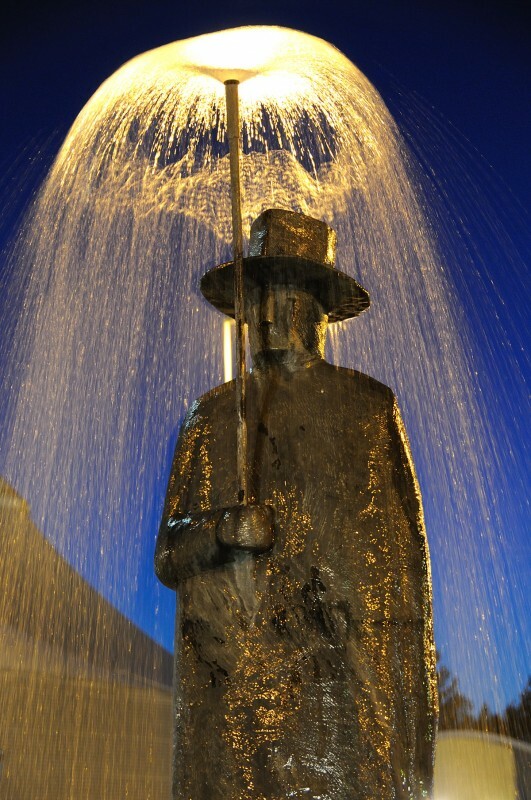 There on a small traffic island stood a man with an umbrella — it was raining inside the umbrella. He was appropriately titled l’uomo della pioggia (the rain man). 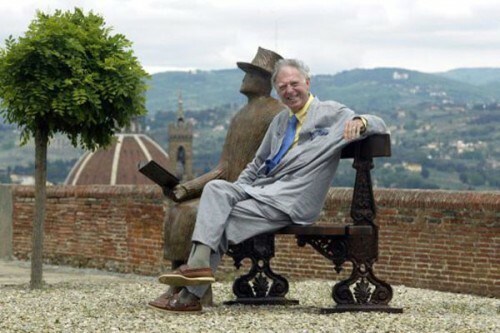 Carlo Buliani catches the light of "l'uomo della pioggia"
Alexandra Kourey of arttrav.com fame caught a different view of the same statue, one winter day when someone forgot to turn the umbrella off — now he was the ice man. My next sighting of Folon was in the butcher shop of Dario Cecchini. He was a friend of the artist and has a ceramic Everyman as well as a watercolor and a couple of sketches created by the artist in the shop on butcher paper. Perhaps I even saw Folon’s art on the covers of the New Yorker and Time in the years before I arrived in Italy and just didn’t know his name. 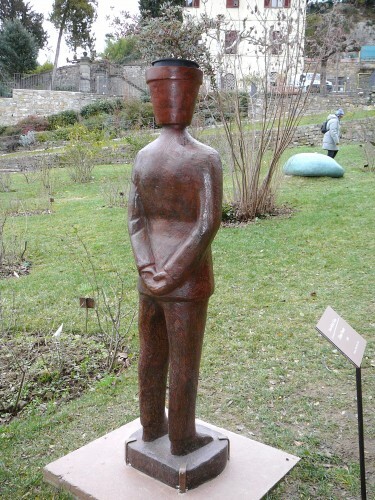 Jean-Michel Folon was born in Brussels in 1934. He grew up in a modest bourgeois family where his father was a wholesale paper dealer. Young Jean-Michel loved to draw and showed a strong desire to be an artist. His father however thought being an artist was impractical and enrolled his son in the architecture program at Ecole Saint-Luc in Brussels. According to Folon, he “spent the next four years drawing bricks” and left the school just six months before he was to receive his diploma. He moved to Paris in 1955 to follow his dreams. Presenting a summary of Folon’s artistry entails skimming through over forty years of creation. His works have traveled the world: from the Metropolitan Museum of Art in New York to the Correr Museum in Venice and from the Gaudí Museum in Barcelona to the Picasso Museum in Antibes. Even though some of his works became part of museum collections, Folon kept a lot of his works for himself. 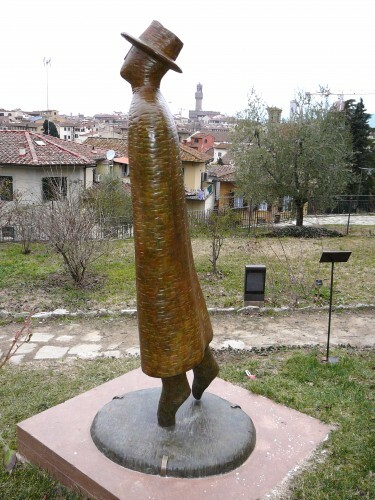 For this, Florence has reason to give thanks because now twelve sculptures (ten in bronze and two in ceramic) are part of a permanent collection in the Rose Garden (Giardino delle Rose) below Piazzale Michelangelo. 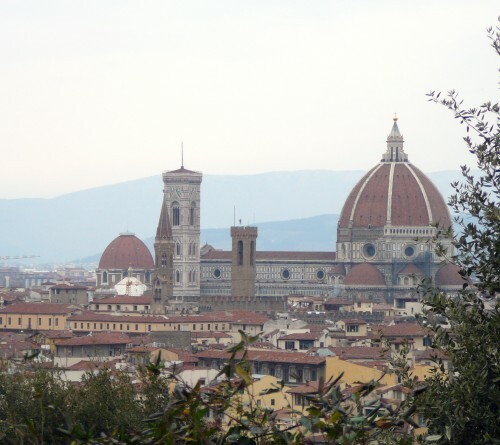 The idea started in 2005 when over 100 of Folon’s works were displayed at the Forte Belvedere in Florence. 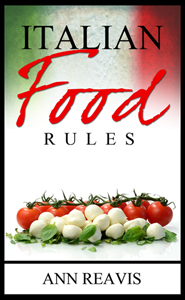 The experience, some say, was an epiphany for Folon, who was passionate about Tuscany, and was married to an Italian, Paola Ghiringhelli. He dreamed of permanently displaying his work in the perfect Italian garden with good lighting and a spectacular view. It was his desire that his bronzes would have a yearlong dialogue with the vistas he loved. Sadly Folon died soon after the close of the 2005 exhibition. But Paola persevered. Clearly a woman of fortitude, she fought the Florence city government that was happy to take her husband’s statues, but wanted to stick them in an obscure park in the periphery of the city. 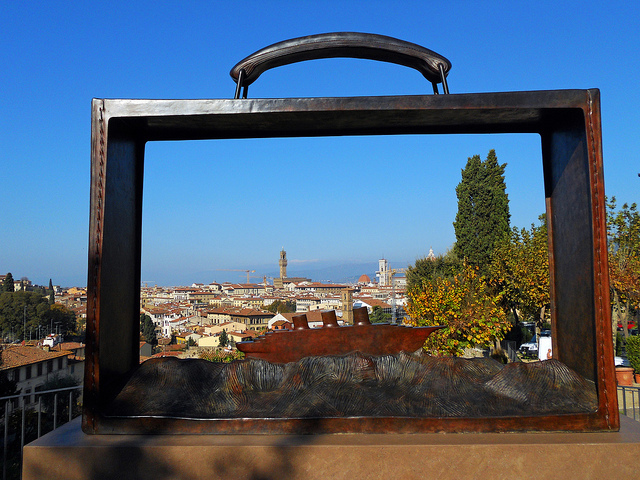 She remembered how Folon loved the way his bronze suitcase Partir framed the Duomo in 2005. She wanted the same effect and knew it could be found in the Rose Garden located at about the same distance above the Arno as Forte Belvedere. But the Rose Garden was only open a couple of months a year, complained the powers that be. So? Open it all year …. And it finally happened. The Rose Garden is open all year and last fall Folon’s bronzes were installed. Even now, when there are few flowers and it is very cold, the garden is a joy to explore. Colorful graphic maps help you to find each of the sculptures, although the positioning of the ceramic pieces still needs work to show them at their best. The highlight is certainly Partir — the huge outline of a suitcase with a ship riding sea waves inside — but even better, it frames the Palazzo Vecchio and the historic center. Surely some day there will be a series of photographs that celebrates the seasonal changes framed by this bronze. The three Everymen, one with a flower pot for a head, another getting set to fly off in the winter wind, and the third simply entitled Walking, are classic Folon. The man reading on the bench kindly leaves you room to join him. The cat-bird is the most whimsical animal, but be sure to find the fish-man in the pond, the streaking bird, and the water-spouting beast called Vivre that is a mix of at least four creatures. So that Folon’s contributions may be enjoyed in any season, the Giardino delle Rose will now remain open year-round. It is an oasis of quiet, ever changing with the seasons, similar to the Bardini Garden, in that, unlike the Boboli, it is usually empty of tourists. 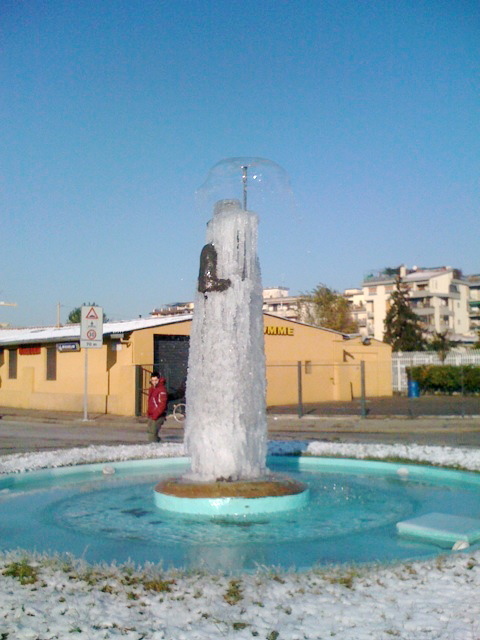 Admission to the Giardino delle Rose is free. The reason the garden is never crowded is that it is off the beaten tourist track. To get to the garden, starting from the top at Piazzale Michelangelo, go down the stairway (Via di San Salvatore al Monte) descending from Viale Galileo. From the bottom, go through the porta at Via di Belvedere; walk up Via del Monte alle Croci until you see the stairs. There will be a small door in the stone wall to the garden at the intersection. 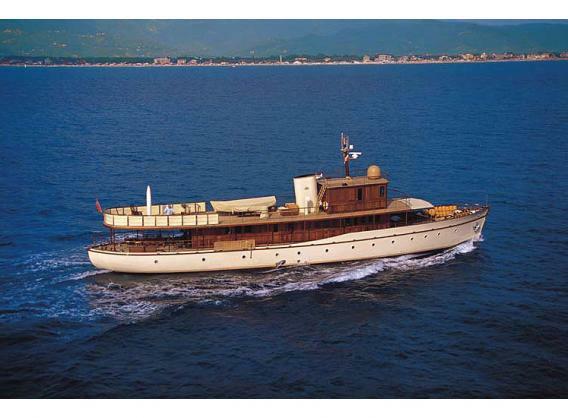 Folon left Florence after the Forte Belevedere exhibition in 2005 to focus on his new passion — a 1930 yacht that he called Over the Rainbow. But that’s another story, for another time.